'Chickasaw Sue' ( James Gibson, R. 1982). Seedling #49-9B. BB, height 26" (65 cm), Midseason bloom. Standards orange-red (RHS 31A) and violet blend; falls white ground, stitched orange, red and brown on edge and hafts; bright orange (28A) beard; ruffled. Seedling #22-4A: (( 'Co Co Mocha' x seedling #83-6B) X seedling #40-2B) seedling #X 72-4C: 'Golden Garnet' sibling. Gibson 1983. Honorable Mention 1985; Award of Merit 1989. From AIS Bulletin #248 January 1983 Introducing CHICKASAW SUE-BB, M, 65 em, Plicata, #49-9B. $25.00. A crisp, clean, bright colored plicata. Fluted stands are an orange-red blend with a violet blush (31A). They are slightly open with strong midribs. The orange-red and brown speckled rims and hafts of the ruffled falls contrast beautifully with the clear white ground. Lovely and dainty blooms on excellently branched stalks with 6 to 8 blooms. Orange-red beards (31A) add to the sparkle. The 26" stalks and 4 x 4" blooms carry through the border motif. An attention getter. Gibson Iris Gardens. 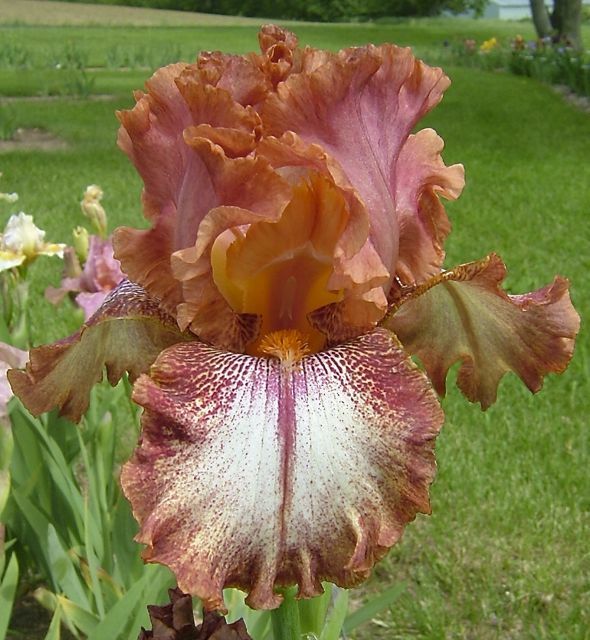 JPG CHICKASAWSUE1.JPG manage 146 K 22 Nov 2018 - 22:23 Main.TLaurin Photo by Debbie Carpenter-Iris Splendor Garden-Australia.